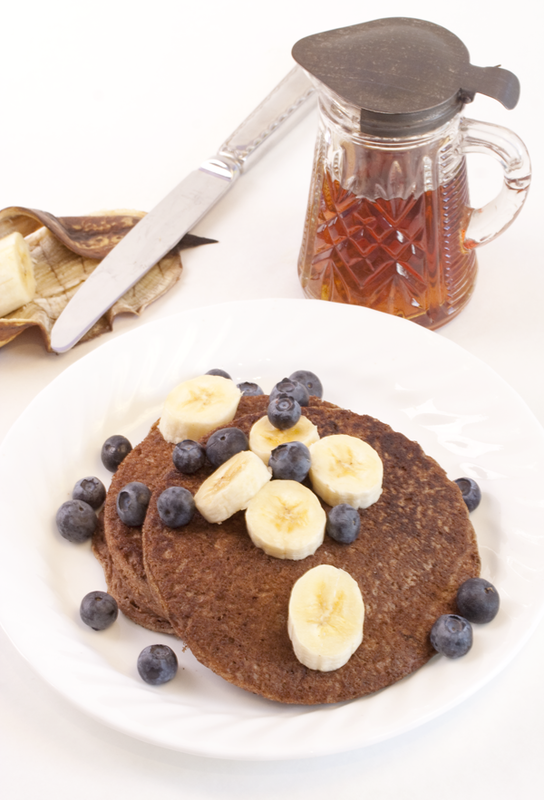 Regular vegan pancakes are one thing but whole wheat vegan pancakes are a whole other beast. I added just 1/4 cup all purpose flour and 1/2 tablespoon cocoa powder to help make it fluffier. You don't taste the cocoa much. Ever notice how vegan chocolate cakes always turn out perfectly tender? There is something, maybe the acidity of cocoa, that gives chocolate cake that extra lift. So that was my thinking, that a little cocoa powder could do the same for a whole wheat pancake, and it works. 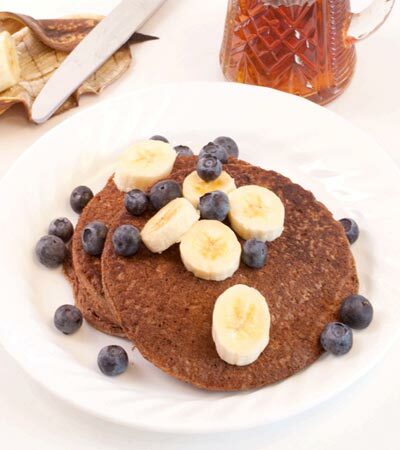 These are pretty darn good and fluffy for a whole wheat vegan pancake. Want to know what others thought about this recipe? Would you like to comment on this recipe? Go to the Whole Wheat Vegan Pancakes blog entry. Before you start let me just say that I think it's very important that you use almond milk as stated in my recipe. I've tried all types of non-dairy milk to make these. The almond milk always results in a better taste and fluffier pancake. Soy milk especially I hate. Soy milk when heated has an off flavor and for some reason makes a gummy pancake. Almond milk is also lower in calories. In a small mixing bowl mix together dry ingredients, then add wet and fold together slowly. Do not stir too much because it could result in a gummy and rubbery pancake. Fold and lightly stir until you have a lumpy mixture. I find that pancakes cook best on a heavy cast iron skillet. Thin metal skillets just don't absorb heat very well and you may wind up with a scorched pancake that isn't done in the middle. In any case, place the skillet on the stove, spray it with a bit of canola oil and turn it on high for a minute or two to get it heated. Turn it down to medium-low heat and pour 1/2 cup of the batter onto the skillet. After a few minutes take a peek at the bottom of the pancake to make sure it's not burning. I like to see bubbles come to the top surface of the pancake before I flip it over, which means it's almost cooked in the middle. Then flip and cook until golden brown on the other side. It's important to not stir the pancake batter again. So when you dip batter out to make your next pancake, don't stir it around. I'm probably picky but I love a perfectly round pancake. There are many round pancake molds that are available but I find them to be too small. The largest round mold I was able to find was 4 inches. Instead, I found a cookie cutter specialty store online with a 5 1/2 inch round tin plated cookie cutter which works perfectly. When you use a mold you get a very even pancake which is great cause the ends don't overcook before the middle cooks.